I've not done a favourites post before but I got myself a few little bits this month so thought why the hell not! Let's start with the total newbies to me shall we? Tanya Burr Lipgloss in Aurora - I'm not a huge wearer of lipgloss (although things must be changing as I bought two recently! ), and I know I'm rather late to the party with this one, but after all the hype around Tanya's lipgloss thought I'd find out what the fuss was all about. I got mine from Superdrug but you can also buy from Feelunique here. The thing I don't like is that there are no testers available so it's a case of if it doesn't look right you've just thrown £7 in the bin! Not good. After checking out the shades, there's probably about 7 or 8 of them, I opted for a light pink colour, something I could just wear on its own as opposed to over a lipstick. Let me tell you guys I love this. The colour is just gorgeous, such a pretty girly candy pink. It's a real high shine lipgloss but not sticky like some, and it smells of Strawberries!! For the price, being the cheaper end of the scale I wasn't expecting much in the longevity stakes but I have to say it surprised me, it does last quite a long time on the lips. Tanya, I am impressed, so much so that I got myself another one straight away for when this has run out, just incase I can't get my hands on another immediately, cos you know that happens! Oh there is one other negative, besides the no testers bit, the application pad at the end of the wand is not the best, a bit flat really, not at all contoured, but apart from those two points, at 7 quid I'm definitely up for trying more colours. Palmers Cocoa Butter - Whilst standing in the queue in Boots I spotted a tub of sample bottles of this well known body butter for something like £1.80. The assistant was scanning the bits from my basket and I was debating whether to pop one of these in or not. As you can see I did and I'm very glad about it. My skin is sooo dry right now but especially my elbows, they are beyond dry and needed special attention. I slathered this on as soon as I got home and you could hear my elbows breathing a sigh of relief!!!!! This will now be one of my beauty staples. Oh and it's smells fab too. Benefit Rollerlash mascara - There's not too much to be said about this new product as I've said it all here in my review (please click & read) but I really do like this mascara. It does what it says on the tin, lifts and curls wonderfully. Another fabulous addition to the Benefit family. Bio-oil - Certainly not a new product to me! 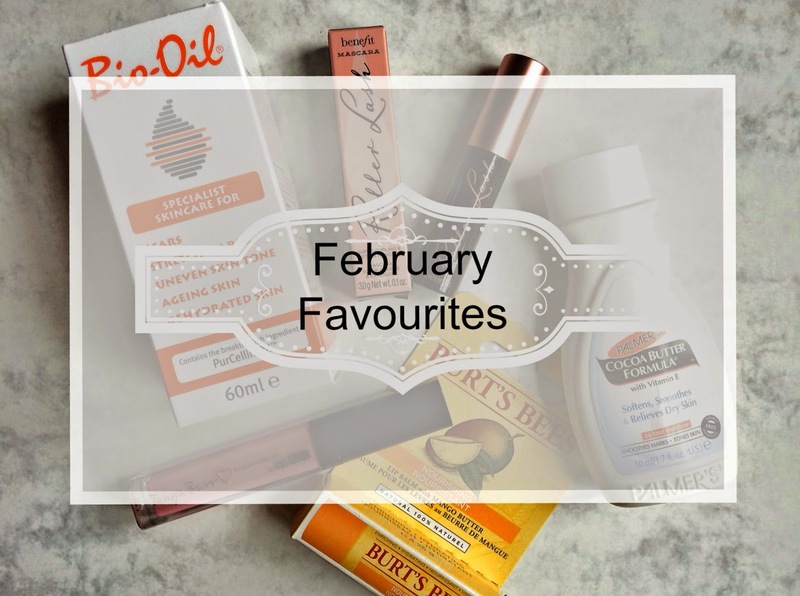 I use this A LOT, especially on the scars I have from numerous surgeries, but I've included it in my Feb faves as I had to get a new one this month. Bio-oil is a skincare oil that helps to improve scars and stretch marks, but then if you don't already know that where have you been for the last however many years! It's also great for ageing and dehydrated skin, that's my category then! I do in fact use it on my face and it helps to breathe a bit of life back into my skin. Burt's Bees lip balm - I tried Burt's Bees a few months back for the first time and have just re-purchased. I may have told you, like a million times already that I have the driest lips in the world and am always slapping something on them, whether it be a balm or lipstick, I can never have dry lips with nothing on, I feel like I've got no lips when they're all shrivelled and dry. This little balm works wonders on solving my NO lip problem. I went for the mango one as it said 'nourishing' on the box and I do like it. Now although I really like this, I still feel my lips need that extra something and what I should have done is shop around before having to rush out and grab this one on repeat because my last one was at the end of its life! They are so dry and I'm on the hunt for something that will make my lips feel hydrated for a long time so I don't have to apply constantly. If you lovely lot out there know of such a product please let me know in the comments so I can investigate and give it a go. Ta.